Jinying Zhu's emerging technology is on the ball, off the chain and poised to make bridges safe by sound. The civil engineer has designed and refined an acoustic approach to detecting defects in concrete bridge decks. Her system represents a much faster, more accurate alternative to a conventional method of identifying delamination, a gradual separation of concrete layers that can subtly compromise the structural integrity of a bridge. "When we find this delamination, we should fix it," said Zhu, assistant professor of civil engineering. "Otherwise, in the winter, salt (or) water will come in and cause further corrosion. Eventually, it's going to reduce the capacity of a bridge by causing safety issues." Zhu's system consists of a push-cart that drags multiple strings of balls made of brass along the concrete. Those balls produce different acoustic frequencies when striking delaminated vs. pristine concrete. Small, low-cost microphones attached to the cart then record the sound, sending it to a laptop that collects and processes the signals. All the while, a specialized GPS unit tracks the cart's location down to the centimeter. 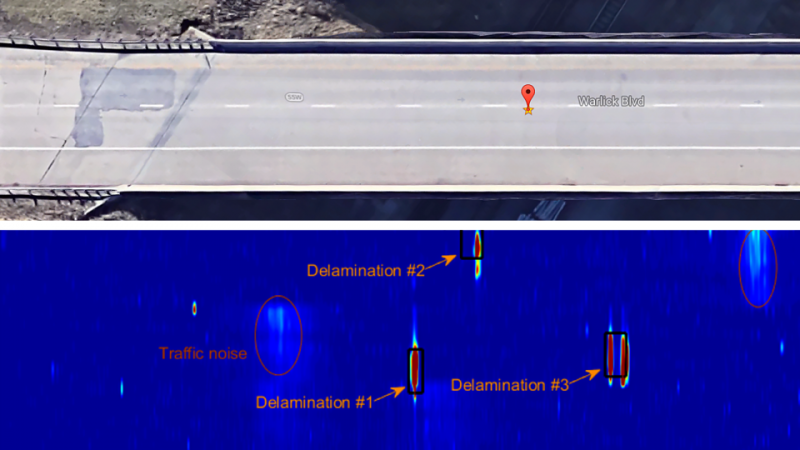 By correlating acoustic signals with the cart's position, the system's software can automatically generate a color-coded map that illustrates the location and dimensions of a bridge's defects. Deep-blue segments indicate pristine concrete, with dark red representing the most severe delaminations. "Every year, you see lots of construction," Zhu said. "Bridges need to be repaired. But before (agencies) decide how many resources should be allocated for repair, they need to understand the condition of the bridge. This technology provides a very quick way to get that information." With support from the Nebraska Department of Transportation, Zhu and her colleagues have recently demonstrated that the system could assess bridges at least several times faster – and with greater confidence – than existing methods. Bridge inspectors have traditionally hunted for delaminations by dragging chains across a bridge deck, listening for hollow spots and marking them with chalk or paint. "It's a very slow process, and it's subjective," Zhu said. "Some delaminations are difficult to check." A more systematic but even slower approach, known as an impact-echo test, involves tapping concrete with a steel ball and recording the acoustic signatures with a contact sensor. Zhu wondered: How could she meld the relative efficiency of the chain-drag approach with the accuracy of the impact-echo method? After writing an algorithm that would help differentiate between the acoustic signals of delaminated and intact concrete, Zhu used microphones to record the sound generated by nearly a dozen different types of chains. But no matter which she tried, the delamination-specific signals she sought were being lost amid a sea of other acoustic waves that arose from the links clattering together. That's when Zhu and doctoral student Hongbin Sun decided to replace chain links with metallic balls connected by nylon string. As they hoped, the ball-and-string combo enhanced the desired signals while reducing the noise. They also found that the balls produced more data points. 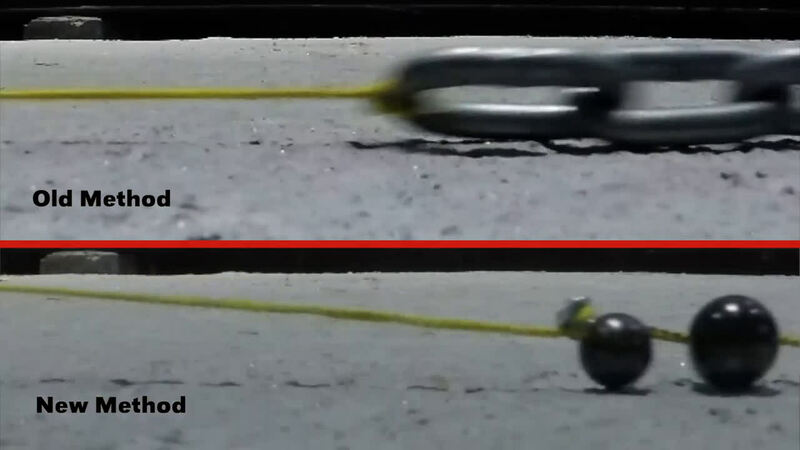 Slow-motion video revealed the reason: Unlike the chain links, which mostly slid along the concrete while being dragged, the balls hopped into the air when encountering even slight rough patches. Each time they landed, they produced another signal – lessening the chances of missing a potential delamination. After varying the size and number of balls, Zhu's team determined that four per string – two larger, two smaller – captured a broad range of delamination frequencies and maximized the number of impacts per second. The team also found an ideal speed – about two feet per second – for balancing how often the balls struck the concrete with how much force they produced when landing. Zhu and her colleagues have since tested their system on multiple bridges in Nebraska, including two at the intersection of Interstate 80, I-480 and U.S. Route 75 near downtown Omaha. She estimated it takes her team about 20 minutes to assess a stretch of bridge that the traditional chain-drag method requires roughly two hours to complete. The next phase will consist of further testing and an adaptation that could upgrade the system's speed. "If we have a trailer behind a pickup or minivan, we can mount this system on the trailer," Zhu said. "And driving on a bridge, even though it might be at a slow speed, is still very fast compared to the conventional methods." Zhu and Sun authored a recent study on the technology with Suyun Ham, a former Nebraska postdoctoral researcher now with the University of Texas at Arlington. Their research appeared in the Journal of the Acoustical Society of America.